The ultimate reality, God or Brahman, may well be said to outstrip the reach of thought; but if we do not try, as thoughtfully as we possibly can, to get at what Guru Nanak really says in this seminal work Japuji -a daily prayer book-how will we be able to benefit from his teaching, as he surely wanted fervently? In the entire history of mankind very few men have been so acutely sensitive to our multifarious suffering, and so keen to show us the way to transcend it for good, as Guru Nanak was. This makes the authors approach this holy work in a new perspective. This volume tries to interpret Mul Mantra in such a way that the celestial attributes listed in it come to be interrelated, as they must be taken to be. It also attempts wherever possible to explain the order of Guru's prolific utterances, be they invocatory or just eulogistic. However ebullient the Guru's utterances may seem to be, they are always significant vehicles of some profound meaning; and also warranted by the running context. Guru Nanak's Japuji is a great work, yet this volume is expected to do some good to every thoughtful reader. At the end, the entire text of Japuji in Punjabi, Devnagari with Roman transliteration is given, making the text accessible to the masses who live outside India and need this prayer to be read in English. Dr (Mrs) Satnam Kaur Has served Mata Sundri College for Women (University of Delhi) for forty-one years, first as a teacher of philosophy and then as Principal. Dr Kaur has a good deal of important academic work to her credit. Her first book, Three Basics of Sikh Religious Thought: Faith, Grace and Prayer (1997), has been well received. 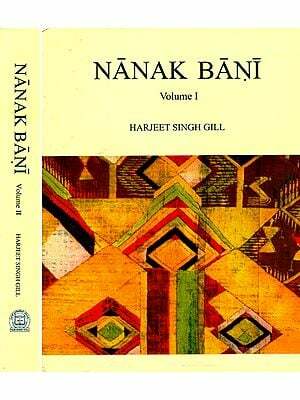 She edited two books Bani Guru Guru Hai Bani and Guru Angad Devji da Yogdan, both in Panjabi. Prof. S.K. Saxena A former professor of Philosophy at Delhi University, has authored eleven books of high repute. He was honoured with the Fellowship of Sangeet Natak Akademi and Padma Bhushan by the Government of India. Guru Nanak's Japuji is a great work. Our abilities, contrarily, are quite limited. Yet we cannot stop hoping that this little book will do some good to every thoughtful reader. In our own imperfect way, we have all along tried to be clear and consistent in our writing; and this should be of help to all those who wish to make the most of this cardinal work of Guru Nanak. It is precisely this hope that we regard as the one immediate reward of our labours. The close of this preface however has to be, first, a word of gratitude to those whose translations of this holy work, Japuji - specially the widely known ones done by S. Manmohan Singh, S. Gurbachan Singh Talib and Dr. Gopal Singh - have been of great help to us all along; and, second, some helpful hints for the reader. In respect of the relevant commentaries, we may add, our choice could not but be restricted. We wanted one by an author who has been widely respected not only for his knowledge of our rich and diverse religious traditions, but just as well for his personal devoutness and catholicity of interest in religious matters. This, we thought, was essential not only for balancing, in our writing, the demands of reason with the evidence of personal religious experience and insights, but for keeping true to the very wide relevance of Guru Nanak's thought. So we fell back on Vinoba Bhave's small but invaluable work, Japuji (Sarva Seva Sangh Prakashan, Rajghat, Varanasi). Vinoba Bhave is not only consistently - yet nowhere without reason - very sympathetic to the essential import of Guru Nanak's entire writing, but is able to draw our attention to quite a few subtleties in Guru's literary craftsmanship. One of these is the use of some such words from different languages as have a kindred, yet not identical meaning, so adroitly that the little semantic difference does nothing to ruffle understanding. Above all, Vinoba Bhave cites apt parallels of so many ubsugtful utterances of the Guru from traditional wisdom of our saints, representing different regions of the country and multiple paradigms of devout living, that Japuji finally comes to appear what it truly is - i.e. not just a single, isolated work, but a quintessential index of quite a few values and emphases of our timeless ethico-religious culture. (a)	The original text of Japuji, in three different languages - namely, Gurmukhi, Devanagari and English (as Romanized) - has been provided at the close of the book. (b)	Guide to transliteration follows the "table of contents". (c)	In respect of spellings we have all along followed the orthographic pattern of Gurbani itself. It may, however, be noted that in reading its text, short vowels are to be quietly passed over, instead of being clearly articulated. The reader is now welcome to turn to Chapter I: Introductory. If, as we hope, he finds the book not only sensible but good to look at, the credit has to go to Mr. Vinay Jain who has designed the cover not only beautifully, but with due care for the character of the book's content, and to our unfailing publisher, Mr. Susheel K. Mittal, who never teres of removing stray errors in printing. Typing the manuscript has been the responsibility of Mr. A.N. Sharma and Mrs. Manjit Kaur Matta. It is not easy to see how a single, incidental remark by an intensely devout person can serve as impulse to attempt an original interpretation of a spiritual classic. Yet this has exactly been the genesis of this little book on Guru Nanak's Japuji. In his brief but scholarly - yet insightful- commentary on this great work, Vinoba Bhave aptly remarks that the more deeply we reflect on this primal work of the Guru, the more rewarding will be our search for its essential, even esoteric significance. It is indeed with this sane counsel in mind that we now venture to turn to the mul mantra which provides a kind of sacrosanct preface to Japuji. It goes without saying that the spiritual sensitivity which lends a manifest loftiness to the mantra is inaccessible to us. All that we can do is to try to interpret what its words appear to signify, in a way which has to be not merely clear and self-consistent, but all along open to whatever - in the work's total compass-may appear relevant to the point at issue. We may agree that, as the Guru himself declares, no amount of mere thinking, howsoever detailed and deep it be, can be quite true to what is commonly regarded as the ultimate (spiritual) reality - say, God or Brahman. In fact, we ourselves hope to show a little later-i.e. where we seek to interpret God's creativity in a way which appeared quite plausible to us -that one has ultimately to forego the merely theoretical approach in favour of the personal testimony of spiritually competent persons (apta vakya). At the same time, however, if we do not try our best to comprehend what this basic work of Guru Nanak, that is Japuji, has to say, how shall we come by, and get imbued with his teaching, and act in accordance with it, as he surely wants us to -for our own ultimate felicity? We are aware that Japuji has been regarded by quite a few eminent scholars as a great, creative -even poetic work in itself. We see no reason to disagree. Yet, as we set out to interpret it, its context cannot be ignored. Its author is no less a person than Guru Nanak, and it is meant to show us the Way supreme. So we have to bear in mind, all along: (a) the edifying tenor of the Guru's own life, on the one hand; and (b) his gracious insistence on our moral uplift, on the other. Hopefully, all our interpretative effort that follows will be determined by this fullness of concern. Here, incidentally, we think it necessary to distinguish this rather uncommon venture from translations of Japuji, of which there has been quite an impressive output from learned scholars. A translation has to go strictly by the order of the text it has to deal with. It is neither free nor is expected to integrate (for better understanding) the content of different parts of the book being translated, howsoever cognate this content may appear to be. Nor is it a part of the translator's function to visualize the context, human or merely situational, in which the work in question might have shaped itself. We, on the other hand, are not at all so constrained. Our work, as interpreters, requires us to heed all along the dual context we have just alluded to. In fact, we have found it gainful to do so. This should become clear as we proceed. What is more, we have also found it needful to heed even the order of Guru's prolific utterances, be they eulogistic, didactic or gently persuasive. Why does he insist, one may ask, so emphatically on God's eternality) adi sachu hosi bhi sachu) almost immediately after the mul mantra? Our answer here is: he had to do it, to counter our likely diffidence in accepting the reality of a kartapurakhu who is possessed of such celestial attributes as are very likely to make us gape in wonder and disbelief. The emphasis in question is, in fact, demanded by our very finiteness, and concomitant inability to comprehend what appears to be utterly unearthly. Be it noted here that, however ebullient the Guru's utterances may seem to be, they are always significant, vehicles (at times) of some profound meaning or experience, and duly warranted by the running context. Clearly, the Guru's devotedness to God's other attributes cannot be taken to disappear when he makes just one of them -say, "the Giver of all life" -his anchor in prayer. They all enliven him through and through. Otherwise, how can one account for the fervor with which the whole of Japuji scintillates?